All you’ll need to get started is online access. Anyone can search, however to reserve materials you will need your Witherle Library patron account number. If you need help getting your patron number, please contact the library desk at refdesk@witherle.lib.me.us or call 326-4375 during regular business hours for assistance. One idea to help you keep track of your patron number is to set the library up as a contact on your mobile phone with our contact information as well as your patron number. Then simply paste your patron number when needed. It can also be filed for easy access on your home computer or tablet. There’s also the old-fashioned way of typing in the number, from the barcode on the back of your library card. You can view all the materials currently checked out to you as well as browse the Witherle catalog using this website. Click on Access Patron Account. Once logged in, you can renew and reserve materials. 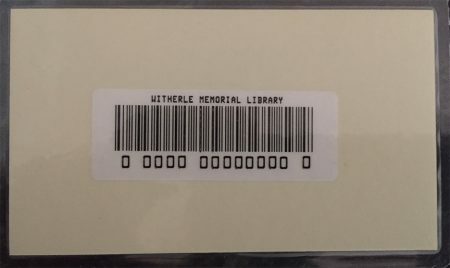 Select Witherle Memorial Library to search our library’s catalog. If we don’t have it, you can broaden your search to include all Minerva locations by selecting All Minerva Locations. You can go to Minerva directly if you like. Use this site for statewide searches. Minerva is a shared library system that brings together nearly 60 libraries of all types from across the state. This is the first place to start when searching for materials outside the Witherle collection. MaineCat combines and links nearly 100 library collections contained in 7 large online library systems. This system includes Minerva along with Maine college library systems, Portland Public, and MILS. MaineCat is a good option when searching for more obscure or academic materials. Not on MaineCat? Contact the library desk, refdesk@witherle.lib.me.us, and request an out-of-state search. The cloudLibrary allows you to borrow and read eBooks and eAudiobooks from your local public library for free using a downloadable app. This app includes a fully functional reader allowing users to read their eBook directly in the app, as well as bookmark and save the position of their book across devices. It also includes an Audiobook player, allowing users to download, play and listen to their books offline. 3. Browse, borrow and read! The Digital Maine Library (which replaces MARVEL) provides every resident of Maine with access to online resources that include a collection of full-text articles and abstracts from magazines, newspapers, journals and reference books. It also provides students, business people, public library patrons, and higher education students and educators the ability to use online learning tools such as consumer information, genealogy sites, and do-it-yourself forums.